Well, it's that time of the month again. Like last month, Google's a bit later than it usually is with these numbers, and it isn't because we have a new version of Android for the chart. Although 8.1 has been released, this month's platform distribution numbers don't include it. Nougat continues to make gains, cumulatively adding an extra 2.7% to its slice of the pie, and Oreo has almost doubled to 0.5%. It was beginning to look like Google wouldn't get around to releasing platform distribution numbers this month, but it just came through. The news, however, isn't great if you've been pulling for Oreo to catch on. After debuting last month at 0.2% market share, Oreo is up just another tenth of a point this month. Meanwhile, Nougat saw a more substantial increase. There's an Apple event happening at this moment, during which the company will probably brag about how unified its iOS user base it. Google chose right now to update the platform versions in the developer dashboard. Android is, well, not entirely unified, but that's nothing new. Nougat is still gaining this month, Marshmallow is on the decline, and there's no sign of Oreo yet. 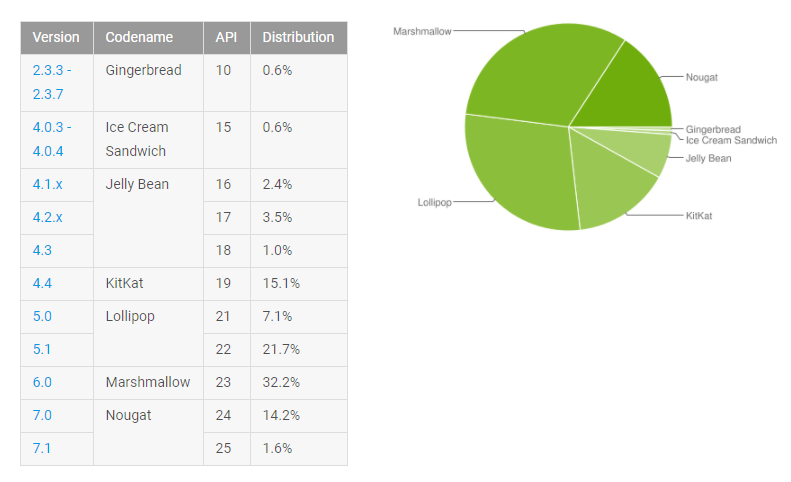 Google has updated the developer dashboards for August, and that means a new glimpse at which versions of Android are floating around out there. 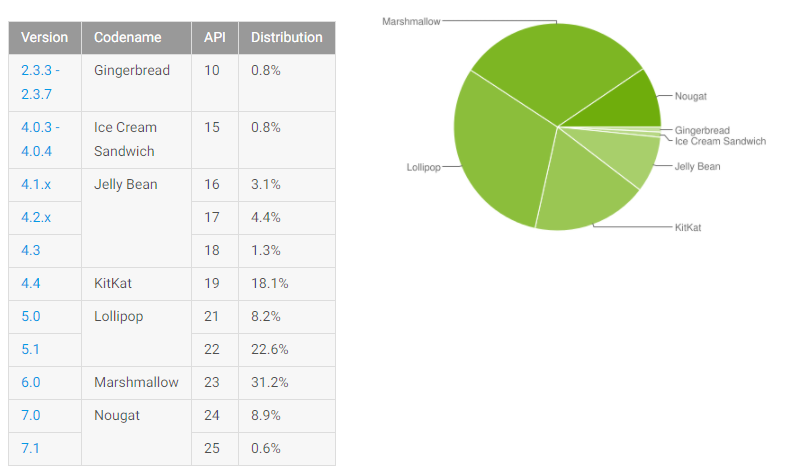 Like last month, Android 7.0 and 7.1 saw a small gain, and most other versions saw a small drop. 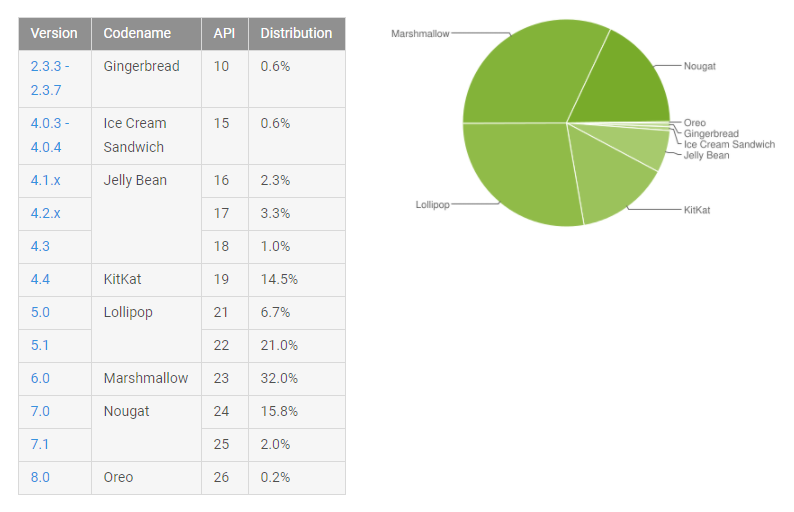 That leaves Nougat on just 13.5% of devices today, and it's entirely possible Android O will arrive before another platform update does.